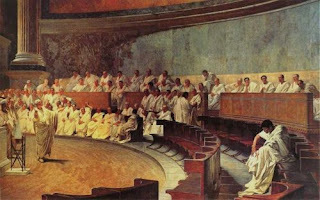 Roman law is the subtext to our politics and our political arrangements- so much of what we do within and what we say about politics derives directly or indirectly from the famous lawyers of the Republic and Empire. The kind of regimes and states that exist all the way around the world today come out of intellectual arrangements bequeathed to us by the Romans- understanding that original framework, trying to perceive why things are the way they are is thus indispensible to understanding what has happened and the states in which we live. For centuries many of the greatest minds within the West have devoted themselves to the study of Roman law. Trying to understand what happened in Rome though to produce this law, trying to understand the decisions that were taken and the moment of the making of the law that defined much of the rest of history is something that historians have struggled with. In this context it is interesting to read the recent review by Paul Erdkamp from Leiden University of Professor Jill Harries's recent book on the relationship between the greatest of the Roman orators, Marcus Tullius Cicero, an advocate beyond compare who became the model for rhetorical studies for centuries after his death, and the jurists and jurisprudence that created the model of the law that we know today. Erdkamp's review argues that Herries (as I have not read Herries you can presume everywhere that I cite her view I am citing Erdkamp's description of her view) places Cicero right at the beggining of the formation of the law- he lived before any of the digests that we know as the final expressions of Roman Law. Cicero lived in the late Republic. During the century before Cicero, Herries argues that Roman law was largely in the hands of notable men, so for example Manilius who drafted important laws on livestock not because he was a great lawyer or jurist but because he was a landowner of note. She argues that an invented history, fashioned by the lawyers, has fooled historians into thinking that a direct line ran back through the centuries from the digests back to the mythical twelve tables of the law, chiselled out at the foundation of the Republic. Rather than that what happened over the centuries between the 2nd Century BC and the later digests- so the second century AD was that the concept of law changed. As, one would almost think, the concept of citizendry lost its power under the Principate- so the concept of a law that was open to argument from any source lost its virtue and law became a professional concept. Before then though Roman judges made their decisions unrestricted by precedent and open to extra legal argument, to arguments made by priests and by eloquent advocates. The jurists were from the lower classes and not noble. Cicero defined law as being both custom and justice- he argued for instance in the case of his own banishment that the public good might trump good procedure. This meme frequently expressed by other thinkers right down to the seventeenth century and beyond attests both to the fact that law existed and to the key point that Harries wants to make about it. The problem is that we tend to abstract laws from their surrounding context. We tend to assume that the authors of the digests and the great legal jurists of Roman Europe- Ulpian and others- were products of their time. Legal scholars have tended to analyse the practise of law in the Roman empire as though lawyers debated without discussing either the rhetorical or other proposals floating around. Herries though helps us understand that though a legal profession and jurisprudence developed in the Roman world- that the world of Roman law was formed by the ideas that Romans were commonly exposed to. Cicero's discussion of justice and custom illustrates this perfectly- custom might be encoded within a law and need study but it always had to be understood in his world alongside a justice which philosophically received extra legal justification. Interesting post. I'm sure the point about the different political contexts of the Republic and Empire is correct. The famous first sentence of Justinian's Institutes - "Iustitia est constans et perpetua voluntas ius suum cuique tribuere" - is the opposite of Cicero's "the good of the republic is the supreme law". Cicero could appeal to higher principles where necessary, and much of his legal argument is politics, policis, politics (In Catilinam). By the time the Empire had been around for a hundred or so years law, at least private law was all about administration and appeal to authorities. I think in order for the Augustan settlement to preserve the form of the Republic there had to be a significant formalisation: someone with supreme power couldn't argue like Cicero because that would be an unrestricted tyranny. If you're a dictator you have to codify everything for there to be a working system of law distinguished from your personal whim. Even in more modern times, it was Napoleon who was the codifier, not the Jacobins. Interesting post indeed. I have never studied Roman law, to my regret, although it has to be said that it was and is far less influential on the Common Law than Civil Law, ie continental legal systems. "The problem is that we tend to abstract laws from their surrounding context. We tend to assume that the authors of the digests and the great legal jurists of Roman Europe- Ulpian and others- were products of their time." I am confused here as abstracting laws from context seems to me to be the opposite of classing a jurist as the product of his time. "Legal scholars have tended to analyse the practise of law in the Roman empire as though lawyers debated without discussing either the rhetorical or other proposals floating around." Not being a Roman lawyer I cannot comment on this, although from what little I do understand, there is a dispute about the authorship of the texts. It would follow that the method of drafting those texts - whether the authors merely debated legal concepts or other sources - should also have been recognised as controversial, unless it was argued that the texts themselves betray the methods of drafting, which I would have thought contentious. The rest of the para I do agree with - subject to the same qualification about my own ignorance. BTW I have without permission used some of your kind words about my own blog on the home page, hope that's ok.
Mike I think there is a lot in what you say this does seem to sit well with the idea of a tyranny. Political Umpire- yeah by all means use my words- I'd seen that and I meant it at the time and still mean it so no problem whatsoever. As to your points about confusion- that's my fault not yours- just typing too quickly I might add a word in italics in order to clarify it but thanks its all my fault there.